Pointe du Hoc is a clifftop location on the coast of Normandy in northern France. It lies 4 miles (6.4 km) west of Omaha Beach, and stands on 100 ft (30 m) tall cliffs overlooking the sea. It was a point of attack by the United States Army Ranger Assault Group during Operation Overlord in World War II. At Pointe du Hoc (sometimes erroneously known as Pointe du Hoe following a typographical error by an American military cartographer) the Germans had built, as part of the Atlantic Wall, six casemates to house a battery of captured French 155mm guns. With Pointe Du Hoc situated between Utah Beach to the west and Omaha Beach to the east, these guns threatened Allied landings on both beaches, risking heavy casualties in the landing forces. 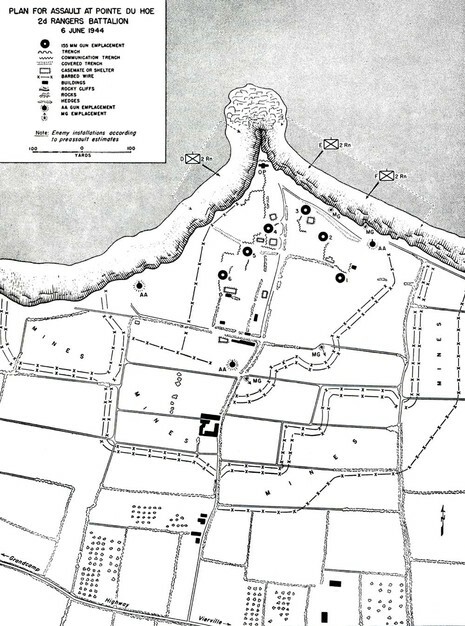 Although there were several bombardments from the air and by naval guns, intelligence reports assumed that the fortifications were too strong, and would also require attack by ground forces. The U.S. 2nd Ranger Battalion was therefore given the task of destroying the strongpoint early on D-Day. Prior to the attack, the guns were moved approximately 1 mile away; however, the concrete fortifications were intact, and would still present a major threat to the landings if they were occupied by artillery forward observers. The Ranger Battalion commanders and executive officers knew the guns had moved, but the rest of the Rangers were not informed prior to the attack. The popular perception that the guns were "missing" on D-Day may be attributed to this decision not to inform the troops prior to the attack. The Ranger battalion was commanded by Lieutenant Colonel James Earl Rudder. The plan called for the three companies of Rangers to be landed by sea at the foot of the cliffs, scale them using ropes, ladders, and grapples under enemy fire, and engage the enemy at the top of the cliff. This was to be carried out before the main landings. The Rangers trained for the cliff assault on the Isle of Wight, under the direction of British Commandos. Major Cleveland A. Lytle was to command three companies of the 2nd Ranger Battalion in the assault at Point du Hoc. During a briefing he heard that Free French sources reported the guns thought to be there had been removed. Lytle became quite vocal that the assault would be unnecessary and suicidal and was relieved of his command at the last minute by Provisional Ranger Force commander Rudder. Rudder felt that Lytle could not convincingly lead a force with a mission that he did not believe in. Lytle was later transferred to the 90th Infantry Division where he was awarded the Distinguished Service Cross. 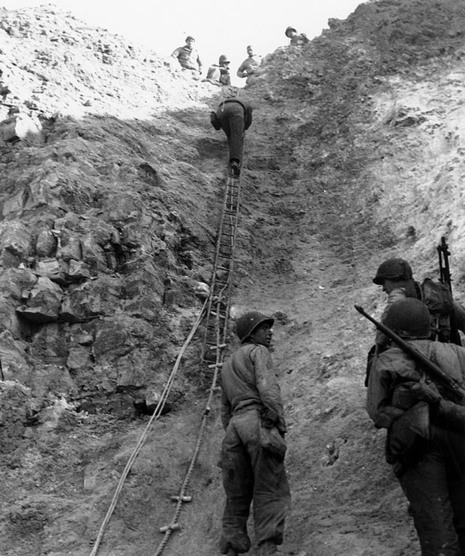 Despite initial setbacks because of weather and navigational problems, resulting in a 40-minute delay and loss of surprise, the cliffs were scaled and the strongpoint was assaulted successfully, with relatively light casualties. Fire support was provided during the attack by several nearby Allied destroyers and British LCS's. Upon reaching the fortifications, most of the Rangers learned for the first time that the main objective of the assault, the artillery battery, had been moved out of position, possibly as a result of air attacks during the buildup to the invasion. It is said that German Field Marshal Erwin Rommel gave the order to move the battery since he had recently been placed in charge of the coastal defenses of Normandy. Removal of the guns had actually been completed on June 4, 1944, but poor weather conditions prior to the invasion limited a final reconnaissance effort which would have revealed the guns' removal. The Rangers regrouped at the top of the cliffs, and a small patrol went off in search of the guns. This patrol found the guns nearby and destroyed them with thermite grenades. The new battery location inland was sited solely for Utah beach. The costliest part of the battle for the Rangers came after the cliff assault. Determined to hold the vital ground, yet isolated from other assault forces, they fended off several German counterattacks over the next two days, until reinforced from Omaha Beach. The original plans called for an additional, larger Ranger force of eight companies to follow the first attack, if successful. Flares from the clifftops were to signal this second wave to join the attack, but because of the delayed landing, the signal came too late, and the other Rangers, mostly of the U.S. 5th Ranger Battalion, landed on Omaha instead of Pointe du Hoc. The added impetus these 500+ Rangers provided on the stalled Omaha Beach landing has been conjectured to have averted a disastrous failure there, since they carried the assault beyond the beach, into the overlooking bluffs and outflanked the German defenses. At the end of the 2-day action, the initial Ranger landing force of 225+ was reduced to about 90 men who could still fight. One of the battleships who helped the battalion was the USS Texas (BB-35). It was a nearly 100-meter-high cliff, with perpendicular sides jutting out into the Channel. It looked down on Utah Beach to the left and Omaha Beach to the right. There were six 155mm cannon in heavily reinforced concrete bunkers that were capable of hitting either beach with their big shells. On the outermost edge of the cliff, the Germans had an elaborate, well-protected outpost, where the spotters had a perfect view and could call back coordinates to the gunners at the 155s. Those guns had to be neutralized. 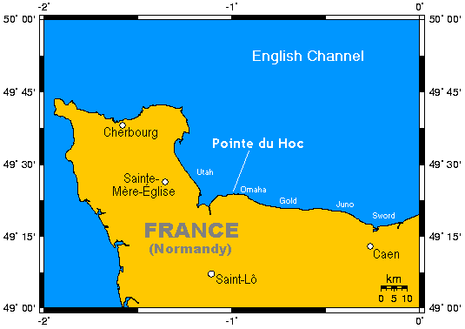 The Allied bombardment of Pointe-du-Hoc had begun weeks before D-Day. 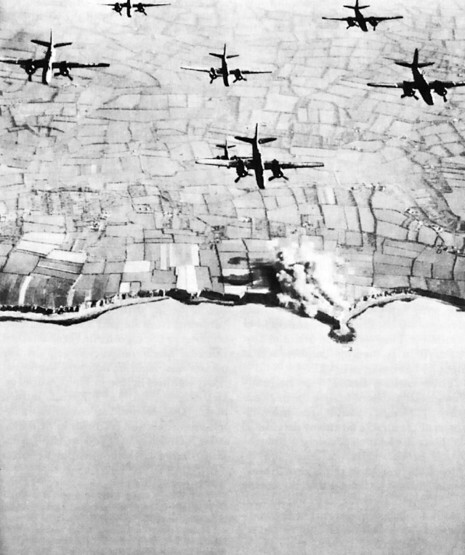 Heavy bombers from the U.S. Eighth Air Force and British Bomber Command had repeatedly plastered the area, with a climax coming before dawn on June 6. Then the battleship Texas took up the action, sending dozens of 14-inch shells into the position. Altogether, Pointe-du-Hoc got hit by more than ten kilotons of high explosives, the equivalent of the explosive power of the atomic bomb used at Hiroshima. Texas lifted her fire at 0630, the moment the rangers were scheduled to touch down.